WARNING: This is a very difficult post that deals with death, but we believe you should read it. It was written by LL and edited by Brad. 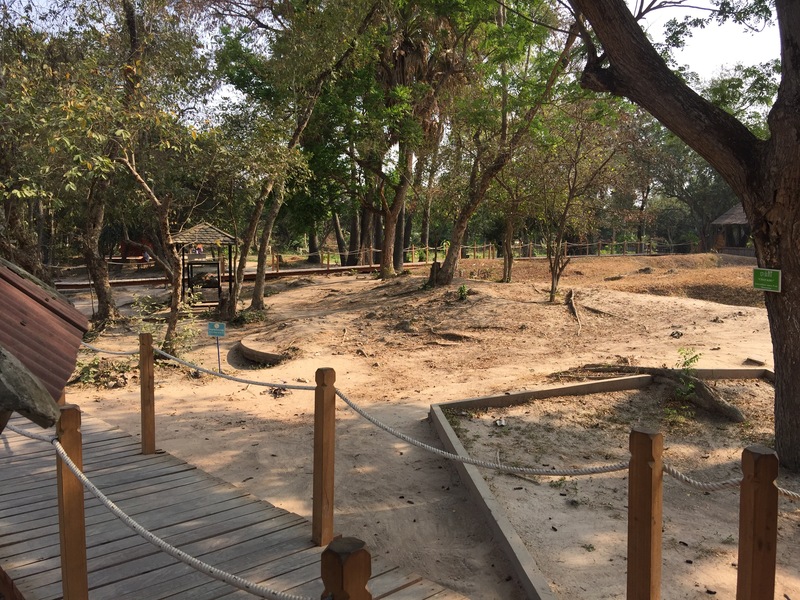 I had no idea how today would go when we got in our Tuk-Tuk and headed towards the Cambodian “Killing Fields.” I knew it would be sad, depressing and informative. But, the heaviness that weighs on me now… I have never felt this before. Perhaps it’s because this genocide was so recent. Maybe it’s because I’ve spent the last week in cities where you can still feel the recovery efforts. This genocide occurred during 1975-1979 — over 3 years and 8 months. 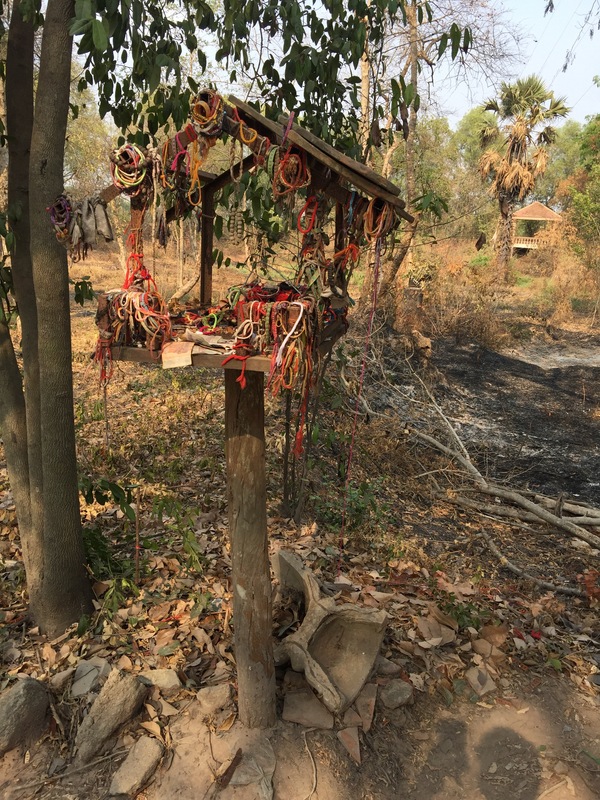 1 in 4 Cambodians were killed by other Cambodians, or roughly 3,000,000 people. For you statisticians, that’s more than 2,200 people each day. 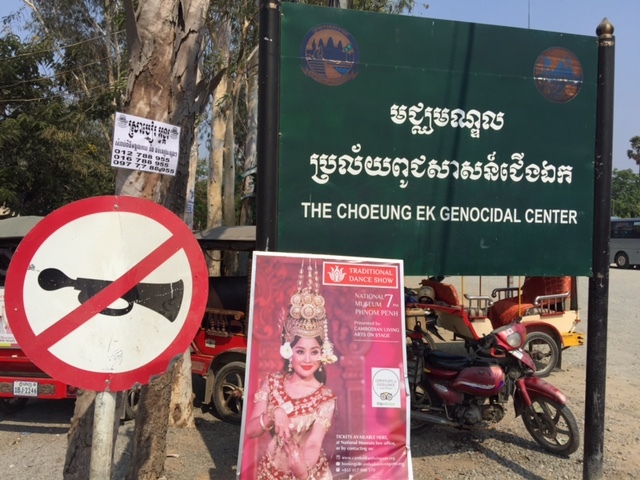 When we arrived at the Choeung Ek Genocidal Center, also known as The Killing Fields, it was hard to even tell we were even there. Farms, restaurants and warehouses surround this place. There was a bar right where we parked. If you didn’t know the fields were here, you could just go right on past. It’s actually quite sad that those who live in this part of Phnom Penh are literally yards away from mass graves. Graves that still give up clothing, teeth and bones today as the earth moves or the rain comes down. They are collected every few weeks by the staff. 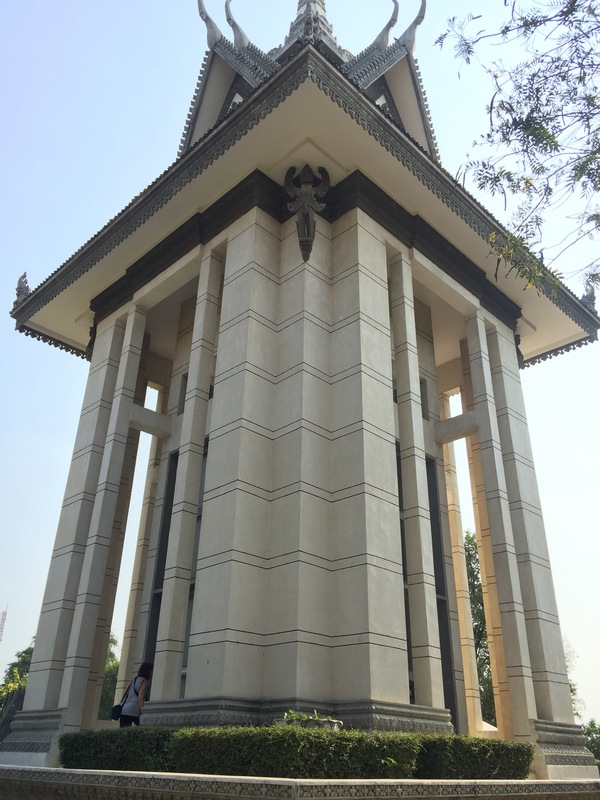 The memorial site has a beautiful monument built in the late 80’s by the Cambodian government towering over the fields which are maybe 6 acres of space. It also has an audio-walk with 19 different stopping points along the path, much like Alcatraz (LINK). It has short clips about where prisoners were brought to the field, bound and shackled, under promises of a new home and future. But this place was not a camp. If you came here, it was to die. Usually upon arrival. In the beginning 50-60 Cambodians were brought each week. As time went on, this grew to 300 per day. When there were too many to kill as they were getting off the trucks, they were shoved into a small holding building that was pitch black so they could not even see each other. Loud propaganda music and the sound of generators drown out the screams of the dying. Guards would check off their list that each prisoner got off the truck. Then once confirmed, they were killed. Not by bullets – bullets were expensive. Nothing quick or easy. The executioners would use farming tools, knives and even the leaves off the palm trees. The bodies were dumped into mass graves. They were covered with a chemical DDT to mask the smell. But also, since the killings were not with bullets, many were not yet dead when they went into the grave. The DDT would finish the execution. As you walk through the fields, you walk along low “bridges” so that you are not actually walking on the graves. Where there were bodies the earth has a large hole. It’s like a open wound. There was also a mass grave of babies. 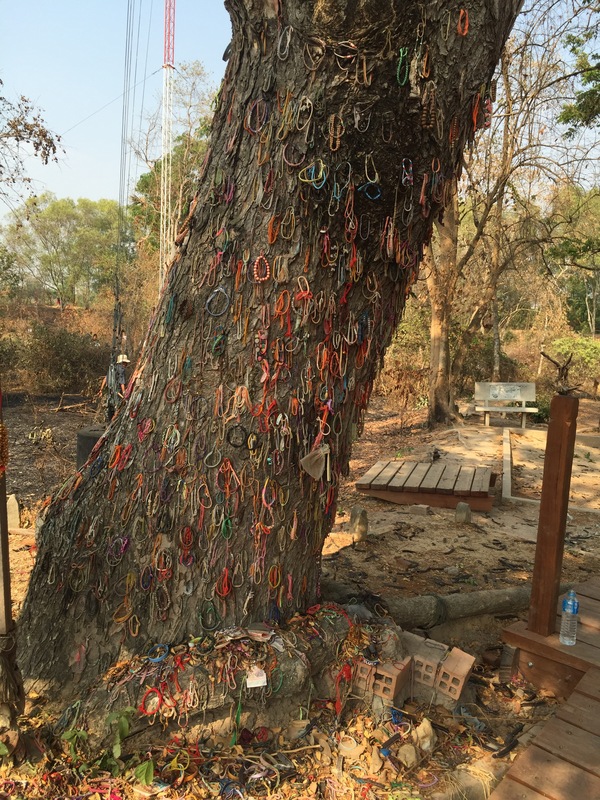 This picture of a tree covered in bracelets is the “killing tree,” where they mercilessly killed the babies. Everywhere there were bodies you will find bracelets left for the victims. Who were these victims? Educated, artists, those who wore glasses (they must be educated because the could read), those with soft hands and anyone who was against the Khmer Rouge (pronounced “Ku-mair”). Farmers and the poor were praised as the true people, but were forced to work hard labor for at least 12 hours a day. They too, of course, began to die as they were only fed some rice soup at the end of the day. What’s also terrible about this story is the US was still daily bombing Cambodia as part of the aftermath of the Vietnam war. While mostly along the borders, they also began to bomb at random inside the border to see if the Vietnamese army was hiding in the jungle. The leader of the Khmer Rouge, Pol Pot, assumed control of the country by trickery and force. His army of young countryside boys was able to evacuate all the major cities in the first few days in April 1975, claiming that the Americans were going to bomb the cities next. As the population poured into the countryside, they split families up. They took all money away. If you were not those targeted for killing, you owned nothing except the clothes on your back and maybe a soup bowl. The genocide only stopped because the Khmer Rouge finally attacked the Vietnam army who had just fought the Americans for years. The Vietnamese absolutely crushed them. In less than 4 weeks they had taken the entire country of Cambodia, and driven the Khmer Rouge into the mountains. They occupied the country for about a decade. Above: a home for the ghosts and spirits of the dead to reside. Mind-bogglingly, the murderous Khmer Rouge regime was still acknowledge by the US and other major powers such as the UK and Germany as the proper government of Cambodia, and so the Khmer Rouge were still given a seat at the UN, and foreign aide. This genocide is not the first, it hasn’t been the last. The US is declaring that ISIS is doing acts of genocide today. If you think this cannot happen where we live, you are wrong. It starts with “otherizing,” labeling, separating and isolating. I know this post is different from any post we have ever written. But, we cannot, in good conscious, not share this with you. 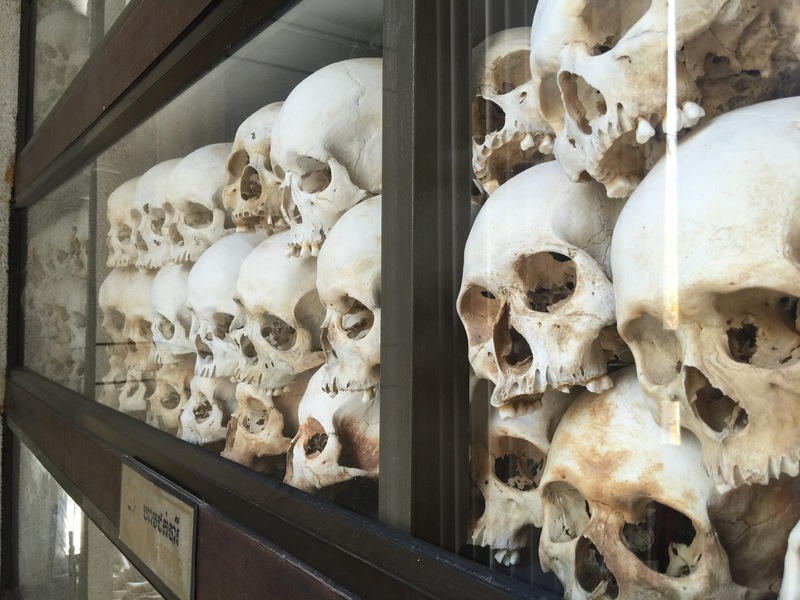 Sadly, even most Cambodians do not know this history – nor do they want to learn about it. It’s not taught to them. Which means history can repeat itself. As you end the tour, you come up to the stupola, shown above. Inside are 17 shelves of bones. Through science, they can tell how each person was killed. Over 2 million people in 3 2/3 years because one man and his followers wanted control. Those different, or differing from their opinions, were wiped out. 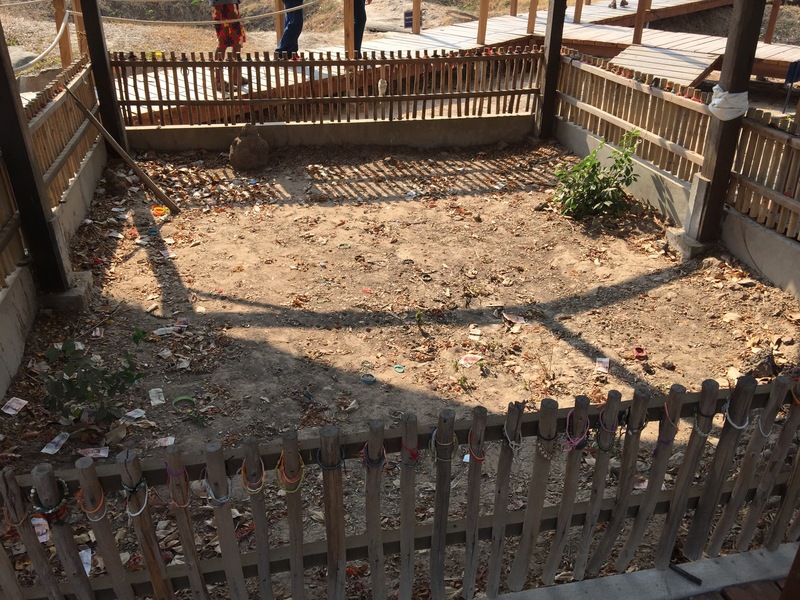 Cambodia is still recovering. May we never know this pain in our lifetime. FYI- I couldn’t read the last blog…it didn’t show up for some reason. The one about one man destroying a country. Looking forward to reading it! Thanks for including us in your travels! Internet issues in Vietnam. Brad is fixing as we speak! Thank you. I was able to read this tragic story. I agree that it’s something we all need to learn about and share with others. It’s very foolish to think it can’t happen where we live. Knowledge is power. God bless you both as you encourage and empower others.